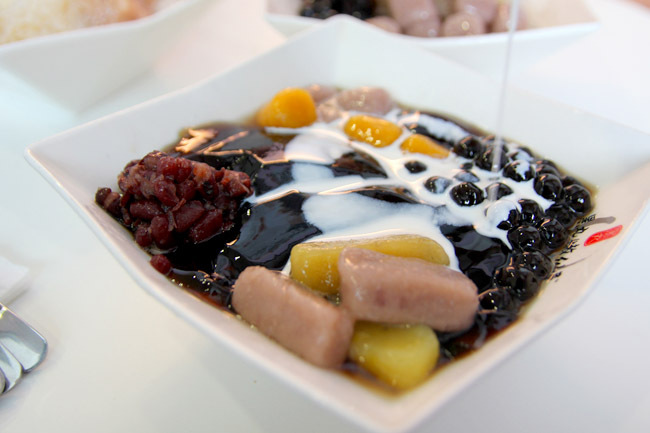 Blackball is said to be Taiwan’s No.1 grass jelly desert chain, with natural ingredients flown fresh from Guanxi (that’s why more expensive lah.) Some people actually thought it is owned by MediaCorp actor Zhang Yao Dong, which I think he is just a paid endorser. Still, how many Taiwan dessert stalls in Singapore you know have the capital to pay for artiste endorsement? The Taiwanese desserts are available cold, warm, hot or icy. The choice for me is obvious, especially when The Star Vista is non-air-conditioned, and I swiftly ordered the BlackBall Signature Crushed Ice ($4.90), Jiu Fen Taro Ball Crushed Ice ($4.50) and Honey Yam Crushed Ice with Milk. 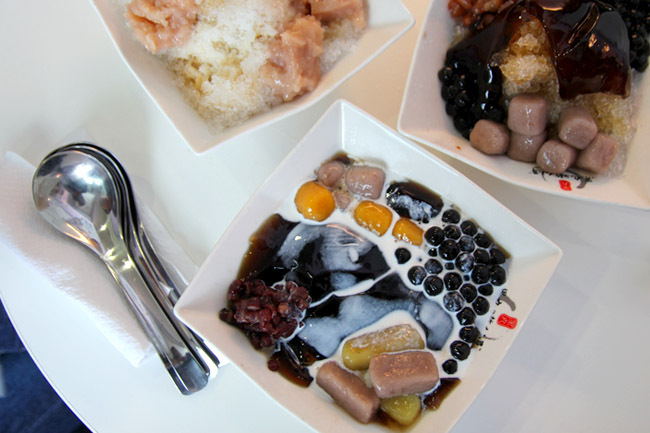 The top-selling BlackBall Crushed Ice comes with an abundant variety of toppings, such as golden sweet potato, pearl, red bean, yam ball, glass jelly topped with milk. Actually, it is qqqqqqquite close to what I had in Taiwan. You know it is not quite there yet, but is still quite delicate especially the glass jelly which has a winning smooth texture yet not being overly sweet. However, the Jiu Fen Taro Ball Crushed Ice is still far from the quality I had in the retro-Chinese backlanes at Jiu Fen. Discounting the price which is probably twice of those in the real Jiu Fen, the presentation is haphazardly messy (The Taiwanese will NEVER allow this to happen), and the taro cubes lack the elegant yet distinct savour of the yam. 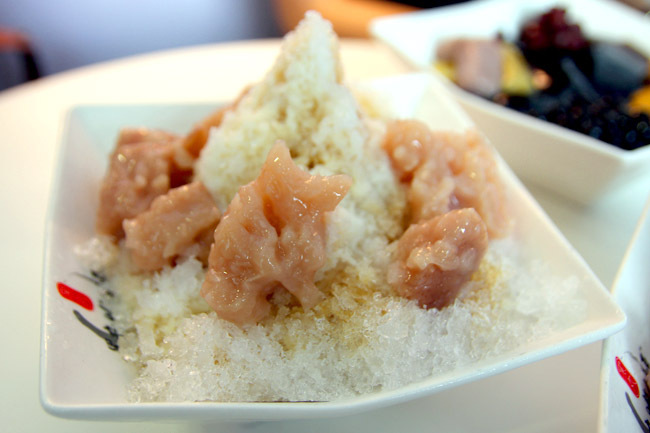 Surprisingly, the Honey Yam Crushed Ice was my table’s favourite, the yam tenderly soft almost disintegrating in the mouth. The aesthetic value can be improved, but refreshing factor is definitely there. The Taiwanese desserts we had are not (I quote my friend) “life-changing”, but are “nice and deserve a repeat visit”. I concur. Even my Taiwanese friend commented that it is not too bad. 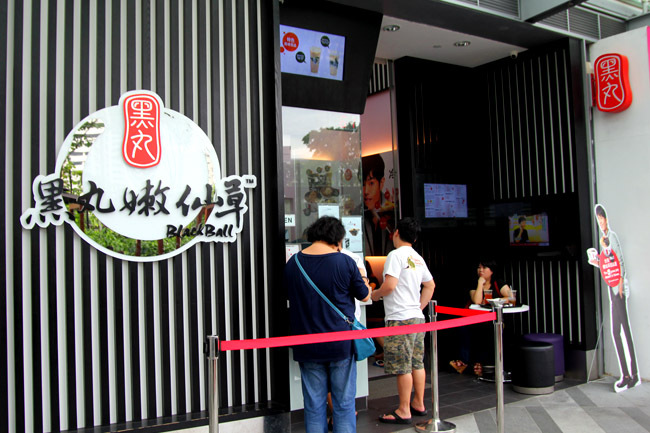 The name “Blackball” comes from a combination of ‘black’ glass jelly and taro ‘balls’. 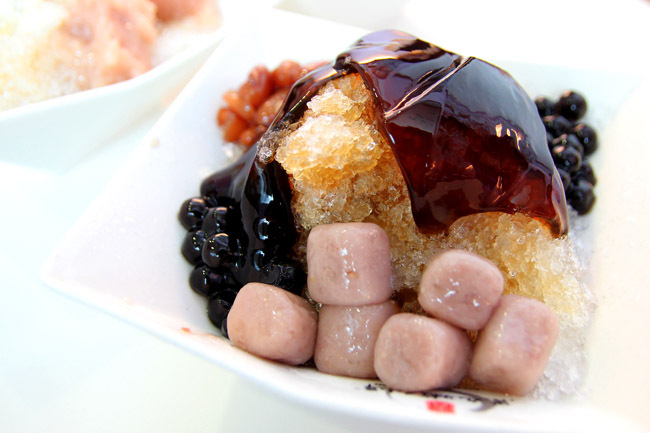 And Blackball’s silky glass jelly is indeed one of the best-tasting available here.